Did any of you hear the eggs-tra special version of The Shipping Forecast on Radio 4 earlier this month? It was eggstraordinary! Feedback listener Dinah Shore had written her own version for the programme, titled The Chicken Forecast, in which different breeds of chicken and their predicted behaviour were read out by Dilly Barlow. “Issued by the vet office, on behalf of the egg timer and toastal agency”, the Chicken Forecast included the ‘general synopsis at breakfast time’ and ‘free range forecasts’. It concluded with the UK outlook for the next 24 hours – “remaining unsettled, with bantams veering westerly to avoid the post van”. What a hoot! Although the clip is no longer available to listen to on the BBC website, we managed to track it down on another site for you. It’s only two minutes long and it is well worth a listen if you keep chickens. Click here and have a giggle! 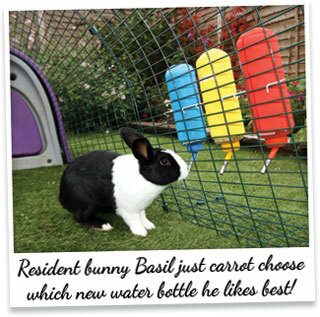 Coloured Bottles and Matching Covers for Rabbits – It’s always good to have a spare water bottle at hand in case of a frost, and these covers will help to regulate water temperature and prevent algae. Microwaveable Pet Bed Warmer – Cats and dogs might get chilly on Winter nights, but pop this in the microwave to heat up and it’ll keep your pet’s bed warm for up to 12 hours. Christmas Pudding Bed – Let’s not forget the smaller members of the household! This cosy bed is perfect for hamsters, gerbils and mice to snuggle up and keep warm. Visit the Winter Warmers page for the full range!